Does NASA's budget need a boost? Astrophysicist Neil deGrasse Tyson explains why the future of space exploration is critical. NASA will be dealing with some tough choices in the years ahead: The space agency has to start virtually from square one on its Mars exploration program. It has to rein in budget overruns on the $8.8 billion James Webb Space Telescope, widely seen as the heir to the Hubble Space Telescope. It's spending hundreds of millions of dollars on commercial efforts to replace the space shuttle, and billions of dollars on the development of a new launch system to send astronauts beyond Earth orbit for the first time in more than 40 years. And to top it off, it's been allotted less money for next year than it's getting this year. How can NASA strike the proper balance in its budget? It can't, astrophysicist Neil deGrasse Tyson says. In his latest book, "Space Chronicles: Facing the Ultimate Frontier," Tyson explains why America's space effort needs more of a boost than it's getting. "I'd really argue for doubling NASA's budget," Tyson told me today. For the past few years, the space agency's spending has amounted to roughly half a percent of the total federal budget. (This year NASA is due to spend $17.8 billion.) In proportional terms, that's half what it was 20 years ago under President George H.W. Bush — and roughly a ninth of what it was in 1966, at the height of the U.S.-Soviet space race. Tyson said that NASA's budgetary situation is so untenable that if he were on the NASA Advisory Council, as he was between 2005 and 2008, he couldn't give any advice. "I would excuse myself from the meeting," he said. "I wouldn't even stop at the White House." 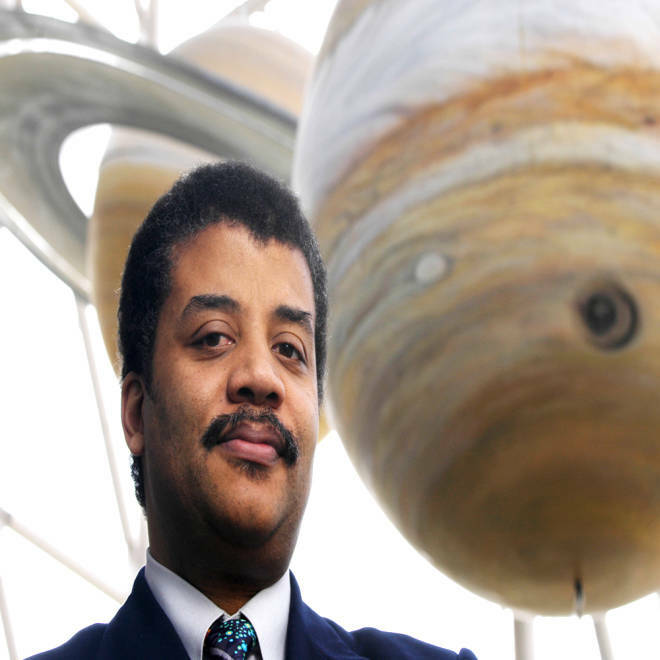 Astrophysicist Neil deGrasse Tyson, director of the Hayden Planetarium in New York City, is in his element among large-scale planetary models. Over the past couple of years, Congress has had a stronger hand in setting NASA's future course, but Tyson thinks the ultimate fix for what ails NASA won't be found on Capitol Hill. "If I write members of Congress with the ideas that I have, in a way, that's circumventing the electorate, because they elected a person to serve their interests," he said. "If I come around the side door and say, 'Do this,' I'd feel uncomfortable in that role. I'd rather address the public. As an educator, this is a fundamental part of what I do: communicating the thrill of discovery and exploration to the public. And if the public is not enchanted by exploration and discovery, that's OK. ... Then I appeal to the economic argument: In this, the 21st century, the nations that embrace innovations in science and technology are the ones who will lead the world." Tyson has been thinking about these topics for years — as the director of the Hayden Planetarium in New York City, as an adviser to NASA and a member of several space policy commissions, as the author of several books and myriad magazine articles, and as the host of the updated "Cosmos" TV series, due to debut next year. "Space Chronicles: Facing the Ultimate Frontier" is adapted from commentaries written by Neil deGrasse Tyson over the past 15 years. He freely acknowledges that the glory days of the space effort were driven not by economics, not by science, but by the Cold War's military realities and image-building imperatives. "We did it for military purposes, but we reap the economic benefits," he said. Which benefits does Tyson have in mind? He noted that there have been plenty of technological spin-offs from spaceflight, ranging from satellite weather forecasting to electronic gadgetry to Tang and Teflon. "Spin-offs are great, but that's not even what I'm talking about," he said. "I'm talking about a culture that wants to dream about tomorrow, and make tomorrow happen today. That culture prevailed in the 1960s and early '70s." Nowadays you don't hear so much about Tomorrowland. "We've been coasting on those investments, and it's finally caught up with us," Tyson said. "Meanwhile, other countries understand this investment, and they are making active gains in their innovations in science and technology. In particular, space is galvanizing that effort. We knew that would happen, because that's what happened to us in the 1960s. This is not some surprise emotion. It's already been tested ... with us. Right now it's in China, but I think we can resurrect it here going forward." Unlike GOP presidential hopeful Newt Gingrich, who made such a splash with his pledge to build a moon base by 2020, Tyson shies away from pointing to a particular destination for the space effort. It could be the moon, or Mars, or an asteroid, or the solar system's Lagrangian gravitational balance points. And unlike Gingrich, Tyson believes space exploration efforts will always have to be led by governments. Routine operations in low Earth orbit could be handed over to private enterprise, just as airmail delivery was handed over to commercial carriers in the 1920s. But exploration is a different matter, Tyson said. Tyson said his book's original title — before his publisher talked him out of it — was going to be "Failure to Launch: The Dreams and Delusions of Space Enthusiasts." "Where the delusional thinking reveals itself ... is the expectation that private enterprise can lead a space frontier. No ... no is the answer," Tyson said. "Not that I don't want that to be the case. There's just no precedent for that in the history of human culture. To take something that's expensive, dangerous, unknown and risky ... put all of those together and you cannot value it in the capital markets. There's no known return on investment." "Space Chronicles" represents Tyson's effort to lay the groundwork for informed, non-delusional decisions about America's future in space — and also work in some of the catchy topics that he's written about over the years, ranging from the prospects for extraterrestrial life to the potential for killer asteroids. "I want to put people on firm ground of how to think about the science and engineering of space exploration, so that when it comes time to make a policy decision, they have some fluency in the ambitions of those who want to explore space," Tyson said. "The book is a celebration of space, but it's also an indictment of all the delusional thinking that has interfered with efforts to resurrect another golden age of space exploration." Is it delusional thinking in this budget-conscious era to propose doubling NASA's budget? Or would it be a policy move just crazy enough to work — and inspire a new generation of innovation? Please feel free to weigh in with your comments, pro and con. Alan Boyle is msnbc.com's science editor. Connect with the Cosmic Log community by "liking" the log's Facebook page, following @b0yle on Twitter or adding Cosmic Log's Google+ page to your circle. You can also check out "The Case for Pluto," my book about the controversial dwarf planet and the search for other worlds.